Faraaz Hossain, an Emory junior who died this summer during a terror attack in Dhaka, Bangladesh, has been awarded the 2016 Mother Teresa Memorial International Award for Social Justice. 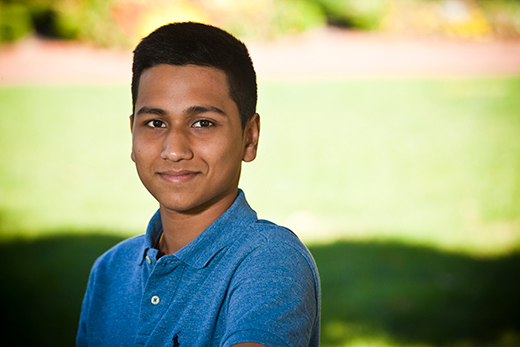 Hossain was recognized for his bravery in choosing to stay with his friends, Oxford College sophomore Abinta Kabir and University of California sophomore Tarishi Jain, after armed militants stormed the Holey Artisan Bakery in Dhaka on July 1. The award was accepted by Hossain's family during a Nov. 20 ceremony in Mumbai, India. Survivors of the siege said that the gunmen separated local Muslims from foreigners and non-Muslims, and released some Bengalis. When the attackers told Hossain, who was from Dhaka, that he could go, survivors reported that he refused to leave his friends. All were among the more than 20 people killed in the attack. Kabir, 19, was a rising sophomore at Emory’s Oxford College from Miami, Florida. Hossain, 20, a junior, was a fall 2015 graduate of Oxford College who had begun studies at Goizueta Business School in January. Both were graduates of the American International School of Dhaka. The students were in Dhaka this summer to visit family and friends when the attack occurred. The Harmony Foundation was established with the goal of fostering harmony between communities and castes and to work toward the benefit of all communities. The Mother Teresa award is intended to honor those who promote peace, harmony and social justice. The award was presented to Hossain’s mother, Simeen Hossain, and his older brother, Zaraif Hossain 14OX 16C, by former Afghanistan President Hamid Karzai and Sister Priscilla, a disciple of Mother Teresa. “It was truly an honor the way such eminent leaders spoke about Faraaz with intense passion, sending a strong message of standing for humanity, especially by embracing the values Faraaz displayed that night,” says Zaraif Hossain. Faraaz Hossain and Abinta Kabir were also honored this summer in Atlanta during an interfaith vigil in Cannon Chapel on Emory’s main campus and in August during a memorial service held at Oxford College. The Mother Teresa award is a fitting tribute to Faraaz Hossain, says Oxford College Chaplain Lyn Pace. “From what I know about Faraaz, how he befriended students and helped put together large-scale social programs to help build community, I have no doubt that this award is a reflection of his last heroic effort — staying with his friends, refusing to abandon them in the wake of such evil,” he says. Throughout this semester, Pace reports that Oxford College students have kept memories of Kabir and Hossain alive. “This has been devastating for our students," he says. "They are definitely not forgotten." PepsiCo Global has also announced plans to provide a $200,000 endowment to create the Faraaz Hossain Courage Award, a $10,000 cash prize presented annually over the next two decades to a citizen of Bangladesh who is under the age of 30, exemplifies personal courage, has taken outstanding initiative to help others and exhibits the highest standards of moral and ethical values. The new award will be launched Dec. 7 when Indra Nooyi, Global PepsiCo CEO and chair, will eulogize Hossain and present the inaugural Faraaz Hossain Courage Award, according to Zaraif Hossain. The purpose of the award is “to recognize acts of exceptional courage by individuals who set examples of empathy for fellow human beings,” according to a PepsiCo press release, which notes the strength of character demonstrated by Hossain in the final moments of his life. “He sacrificed his life for his friends, exemplifying true friendship, standing steadfast against injustice and connecting a humanity of different race, religion and nationality with love and harmony,” the release states.